Australia: ABC1’s Four Corners Exposé of the Treatment of Australian Cattle Exported to Indonesia. 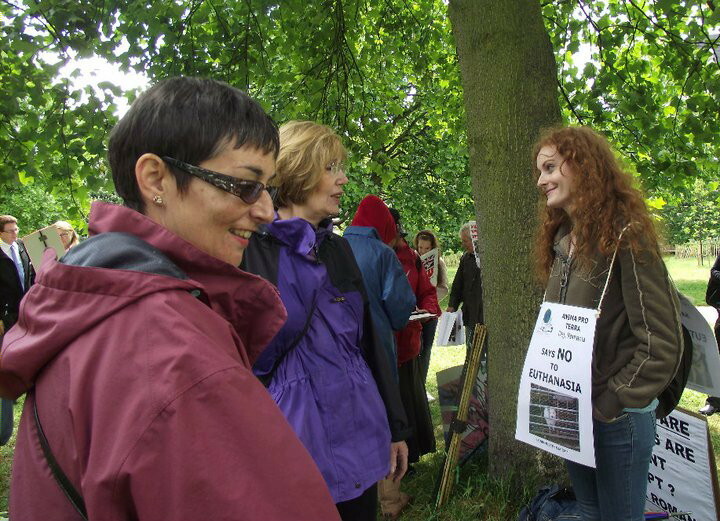 WARNING – Graphic footage of animal suffering shown in the video footage. cattle exported live to Indonesia showed a damning picture of this trade. as Animals Australia’s investigators had witnessed. to help us end this trade. exports to the 11 Indonesian abattoirs investigated by ABC’s Four Corners. Horrific footage from inside Indonesian abattoirs that use Australian cattle has revealed abuse of the animals is widespread. Footage to be aired on ABC1’s Four Corners tonight shows animals kicked, thrashed and beaten, their throats hacked at, eyes gouged and tails broken. According to analysis of the footage by RSPCA chief scientist Bidda Jones, some animals show signs of possible consciousness when they are dismembered. In March this year, animal welfare campaigners Animals Australia filmed in 11 randomly chosen abattoirs in Indonesia and provided the footage to Four Corners. More than a month later, a Four Corners team went to Indonesia and filmed in abattoirs where cattle suffered prolonged and painful deaths. Animals Australia spokeswoman Lyn White brought Egypt’s live export trade to a halt in 2006 after exposing animal cruelty in Cairo. She says her suspicions were raised after the live export industry released a report in January describing animal welfare in Indonesia as generally good. “We had assumed that because there were greater level of industry involvement in Indonesia, the treatment of the livestock would have been better,” she said. The abattoirs featured on Four Corners are well-known to the Australian industry, which has installed equipment and provided training in Indonesian abattoirs to help with the handling of Australian cattle since 2000. The live export industry was shown the vision from four Indonesian abattoirs prior to an interview. LiveCorp CEO Cameron Hall described the scenes as “graphic and disturbing”, and announced the suspension of the supply of Australian cattle to three of the four abattoirs. The fourth abattoir, Gondrong in Jakarta, was the scene of sustained suffering by Australian animals. When asked why Gondrong is continuing to process Australian cattle, Mr Hall says training can address the issues. But Four Corners has revealed the facility has already been visited six times by industry representatives in the past 14 months. There are 100 abattoirs in Indonesia that slaughter Australian animals. Since the trade began 20 years ago, more than 6.5 million cattle have been shipped to Indonesia for slaughter. Indonesia isAustralia’s key market for live cattle exports, taking 60 per cent of all cattle, and in 2010, the trade was worth more than $300 million. The Australian livestock export industry and the Australian Government have invested more than $4 million into improving animal welfare in Indonesia over the past 10 years. The majority of funding has been invested into Australian-designed metal restraining boxes. The RSPCA says the boxes are inadequate and stunning the animal prior to slaughter is the only humane option. There are currently only six Indonesian abattoirs that use stunning. Last week the industry launched its welfare action plan, which included providing stunning equipment to five additional abattoirs by the end of this year. The new plan also says from 2015, Australian livestock will only be supplied to facilities who meet the OIE (World Organisation for Animal Health) standards. But Indonesia is already a signatory to the OIE. Animals Australia spokeswoman Glenys Oogjes says Australia has no power to make Indonesia comply with these guidelines. “The OIE guidelines are minimal standards for developing countries that allow practices that are illegal in Australia to take place,” she said. Agriculture Minister Joe Ludwig said in budget estimates last week that he had been concerned about the live animal trade for some time and criticised the industry for being too slow in addressing welfare concerns. 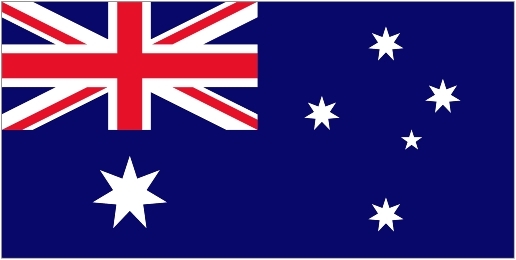 But in April, during a speech to the Northern Territory Cattleman’s Association in Darwin, he reiterated the Australian Government’s continued support of the live export trade. “The live animal export sector is the backbone of many rural and regional communities across Australia, including northern Australia, as it provides a valuable market option for producers,” he said. Watch the full report on Four Corners tonight at 8.30pm on ABC1. 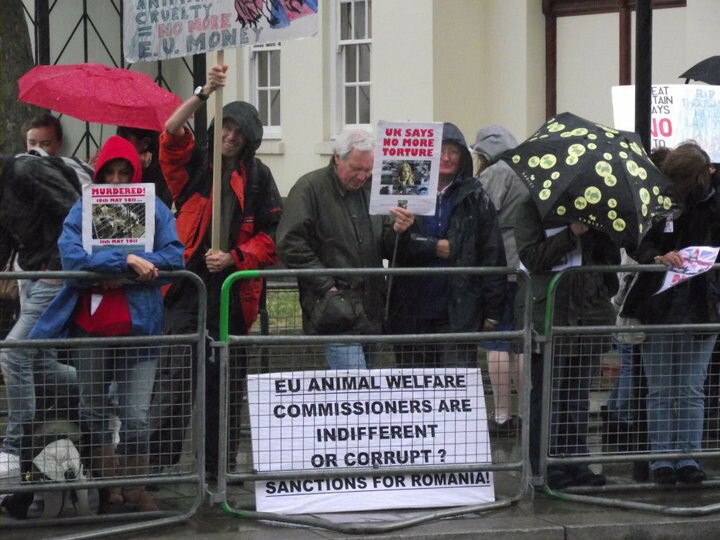 URGENT ACTION FOR ROMANIA – ACT NOW, DONT DELAY. contact details are on the following link. emailing via companies than they do animal-lovers. 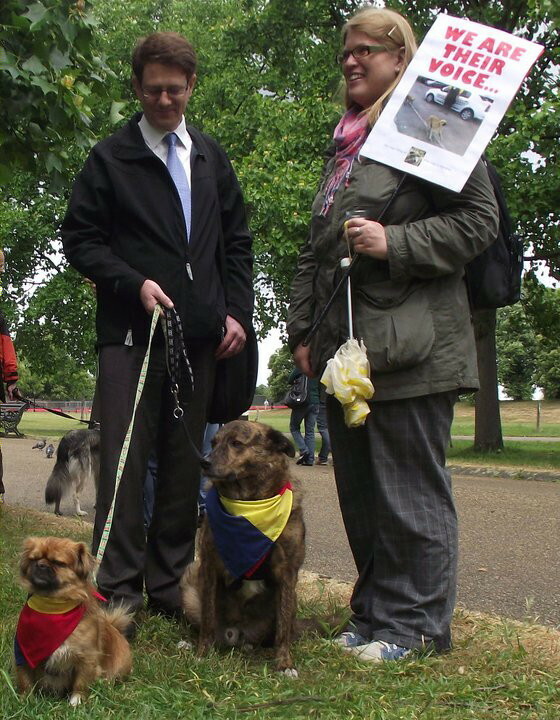 Quick Petitions – Please Sign. Fight against palm oil and save Orangutans. The Tripa peat swamp forest in Aceh, Indonesia is rapidly being converted into one big palm oil plantation. Its related land clearing and burning are further reducing the forest that is home to the critically endangered Sumatran Orangutan. Support our fight against palm oil: sign the petition or visit http://www.wetlands.org! 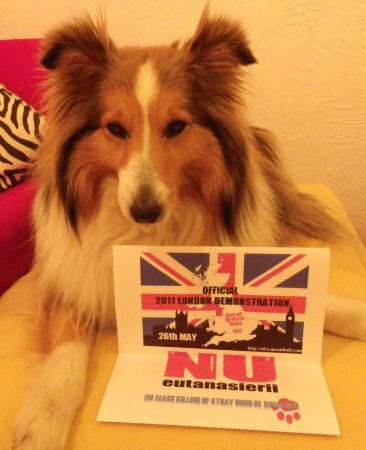 259 have signed so far – help us get to 500. 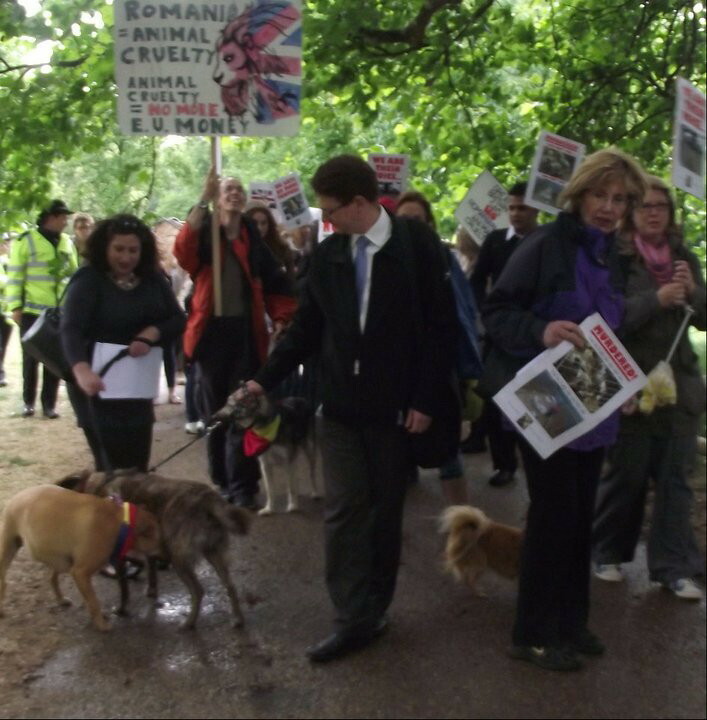 Take Action to close Guzoo and re-home its animals! “Since it opened its gates in 1990, the Guzoo Animal Farm, a private zoo approximately 100 kilometres northeast of Calgary, has been subject to numerous complaints. Despite the issues put foreword, the Alberta Sustainable Resource Department has continued to renew its temporary operating licence. These renewals always come with specific conditions calling for improvements in cages, water, shelter and mental stimulation for the animals. The conditions are often the ones previously set, yet not met, in a previous licensing period. Furthermore, the Guzoo’s policies show a potential hazard to the public. Lack of hygiene, such as leaving feces or dead animal carcasses (food for carnivores) in cages for several days, causes a contamination concern for human visitors. The Guzoo also allows and encourages visitors to interact with potentially dangerous animals, such as lions, tigers, bears, and lynxes. With this petition, we ask the Alberta Government to revoke the Guzoo’s temporary operating licence. 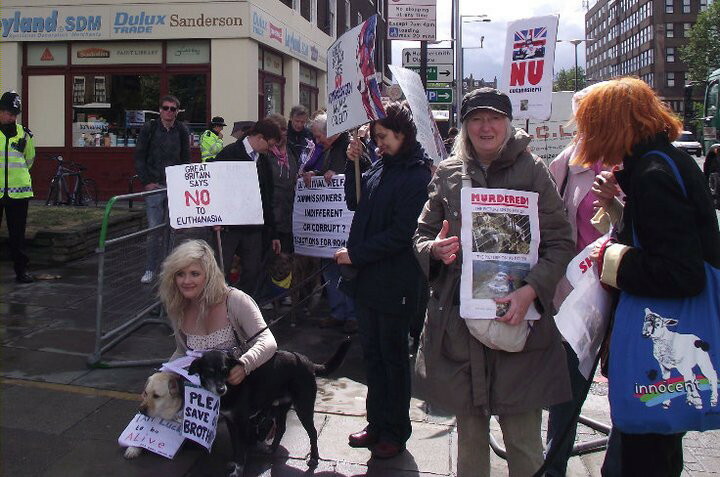 Ban Mink Farming in Denmark where 14 million animals are killed. 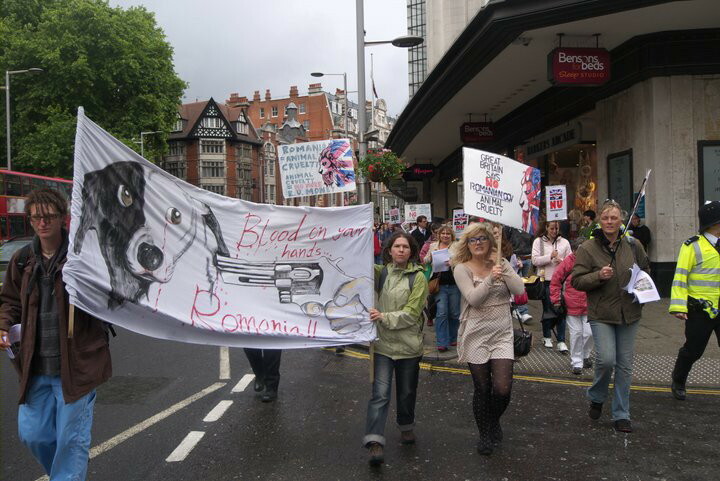 Uk (England): 26/05/11 – Scenes From The London Demo For Romanian Dogs. 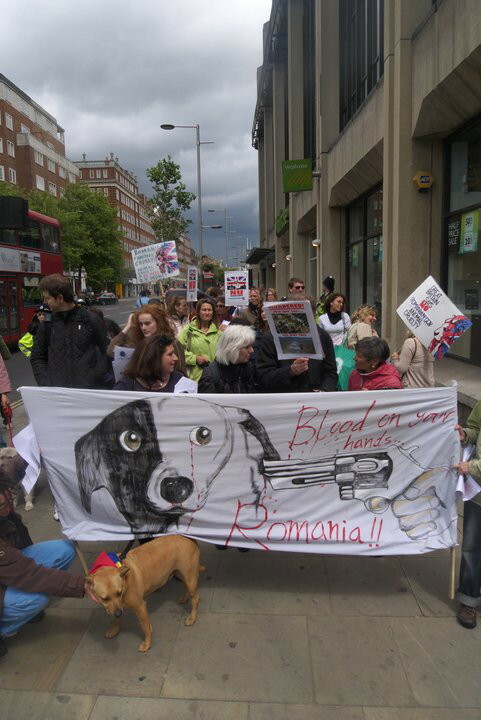 A typical rainy day in London town, but the demo was a real hit in support of the Romanian dogs. Here are some pictures from the day. Some of our previous links are below. To see all, go to ‘Search’ window top right and simply type in ‘Romania’. Then right click or hit the ‘search’ button at the end. 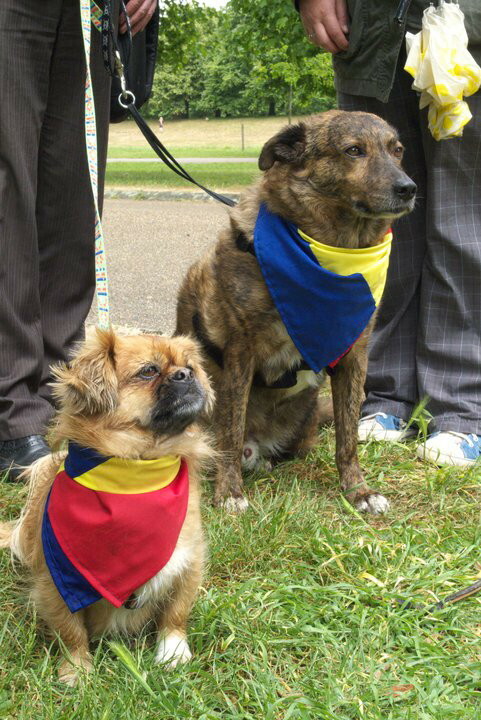 Romania: Sample Letter to Send to Authorities Regarding Proposed Mass Slaughter of Dogs in Brasov. 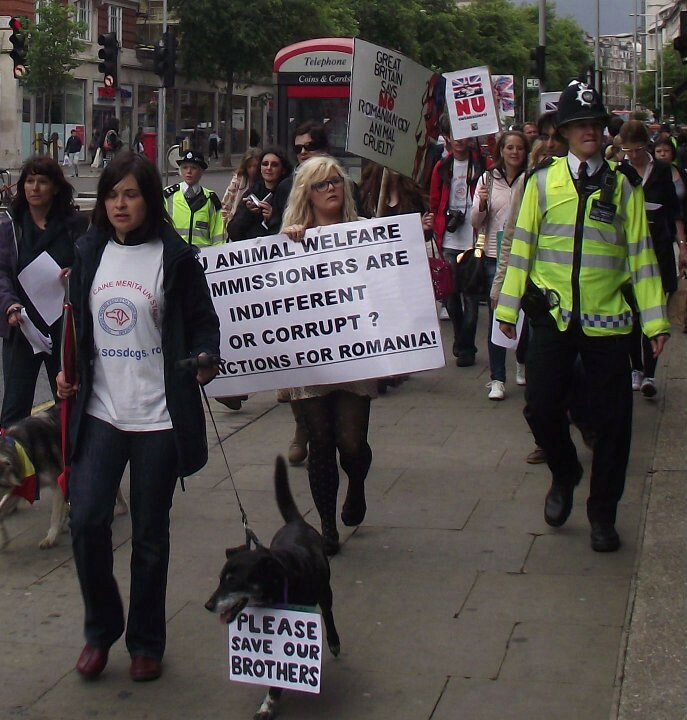 This is a sample letter to write to the Romanian Embassy/consulate in your country, pls google for emailaddress. Please note I have chosen to send you this generic correspondence as it wholly echoes my opinion and beliefs in this matter and is to be treated in the same regard as if I had written the entirety of this correspondence personally. 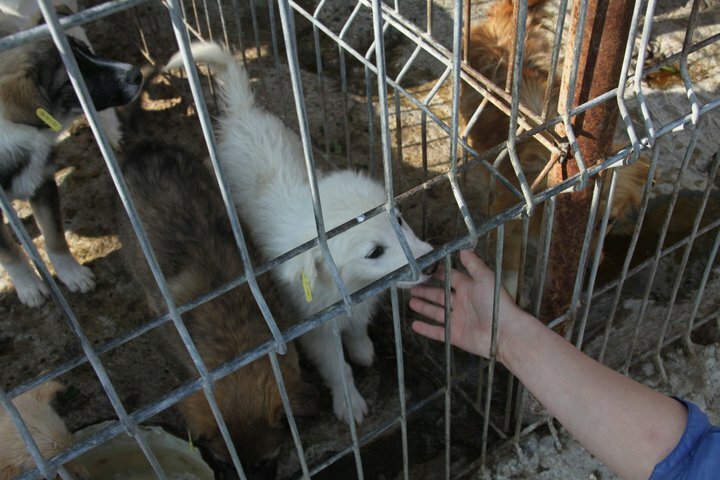 It has been learnt today through the international network that inBrasovit is being planned to kill/massacre all strays within that area. 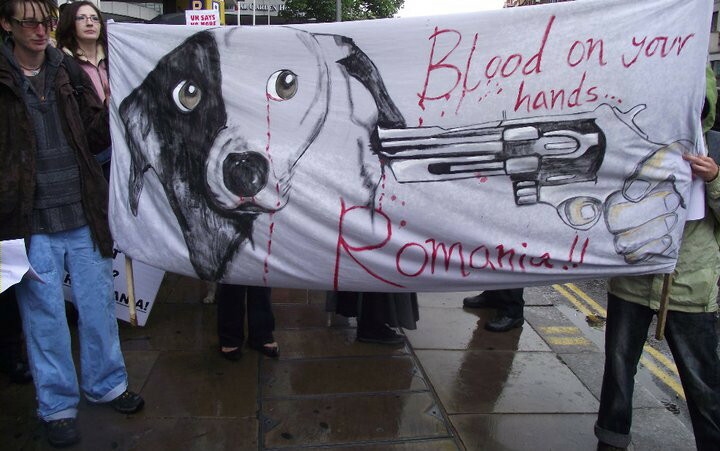 May I remind you that if this mass slaughter goes ahead that the government workers who represent the Romanian Government in that area are in direct violation of European Animal Welfare laws, and by breeching such agreements the Romanian Government themselves are acting criminally, and the European citizens will be petitioning the European parliament demanding for a review of Romania’s status within the EU and an investigation into monies received by your government by that parliament. 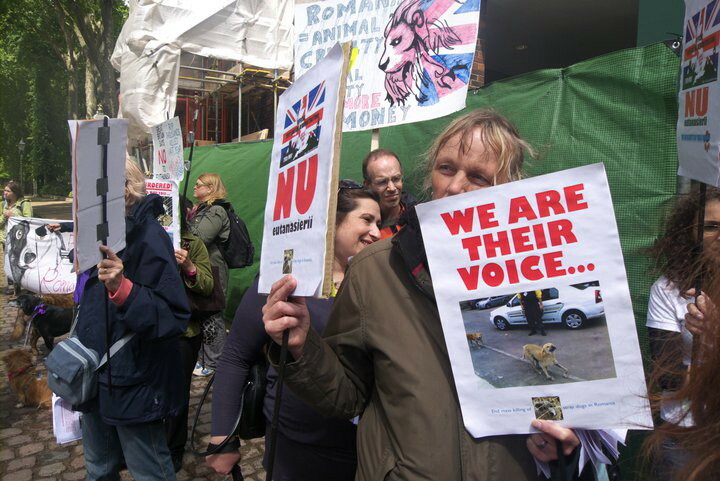 You simply cannot sweep away these proposed actions as you have tried with the slaughter of 220 dogs in anotherRomaniaProvinceearlier this week on 11th May. To mass slaughter on this scale is not only putting your own Government and country under scrutiny but also the veterinary services in your country. Under no circumstances is this horrific proposal to go ahead, the European and International community is already rising up against you, these types of actions will only weaken your position within the European and International community and media, and in-turn the parliaments and Governments that represent the communities within them. You are forcing your hand to an extent where the people who these governments and parliaments represent will demand you be removed as an EU member and along with this the Billions of Euros your country claims and is given each year by those same Governments. China: Activists Save 430 Stolen Dogs on Truck to Restaurants. Chinese animal activists blocked a toll station in Beijing, China, to save 430 dogs that were being transported from Henan Province to restaurants in other parts of the country. According to the China Daily, about 10 dogs in the truck were already dead and another 100 were dehydrated and showing signs of infectious diseases. The dogs apparently had been trapped in the truck for two days with no food or water. 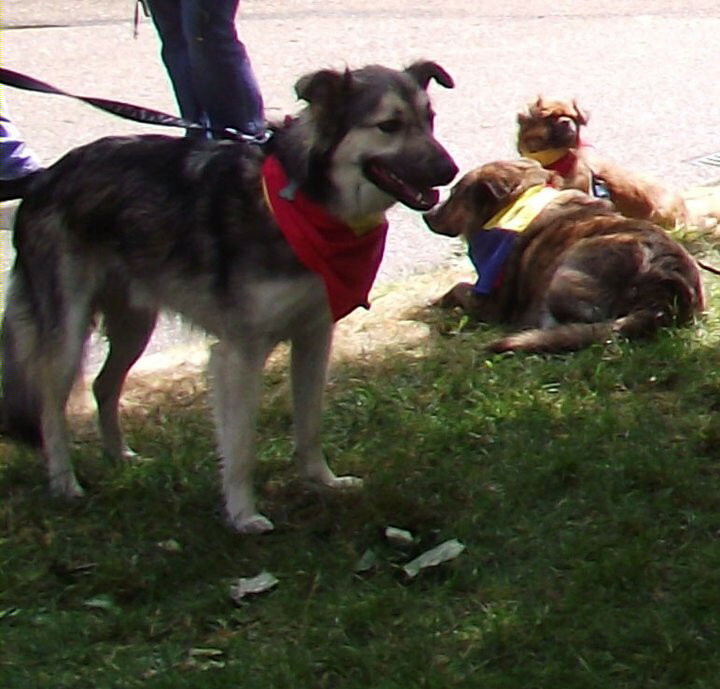 Many wore tags that showed they were people’s pets and had probably been stolen. A motorist saw the truckload of dogs and positioned his car in front of the vehicle to stop it, according to the report. He then alerted animal activists by microblog, and more than 200 people swamped the checkpoint to demand release of the animals. It took over 15 hours of negotiations before the transport company agreed to sell the dogs to the activists for 11,500 yuan, which is about $1,770 dollars. “It is clear that people in Henan have been stealing pets and selling them to restaurants,” said Wang Qi of China Small Animal Protection Association, who added that the dogs included Golden Retrievers and Huskies with bells and nametags still on their necks. Some of the animals were healthy enough to be taken to the China Small Animal Protection Association and will be made available for adoption after 30 days; however, the remainder went to animal hospitals across the capital, according to China Daily. 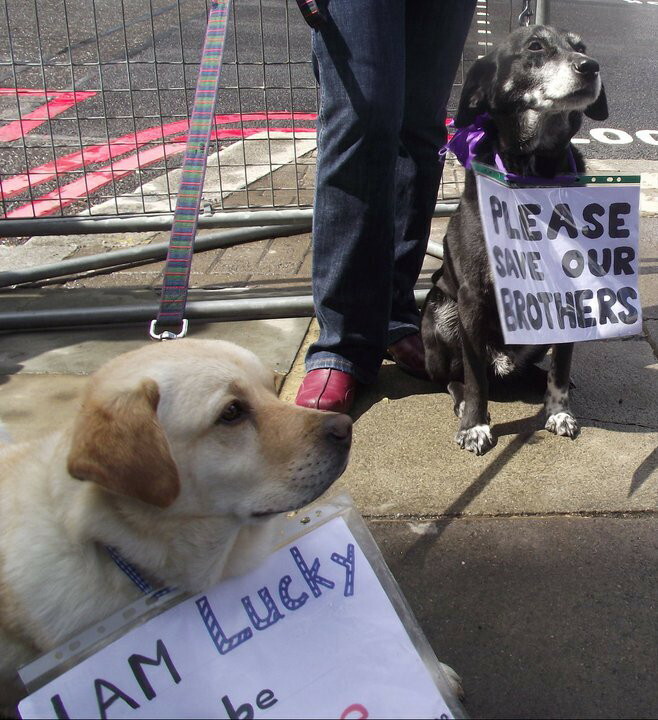 Humane Society International, writes, “The rescue operation will have a long-standing impact on China’s animal-protection movement. “When the caring volunteers have to say goodbye, the eyes of the dogs seem to ask ‘When are you coming back?’” said Professor Lu Di, director and founder of China Small Animal Protection Association. “These dogs are so forgiving. They embrace us humans and never hold our wrongdoings against us.” http://www.csapa.org/english/english. London Calling !! 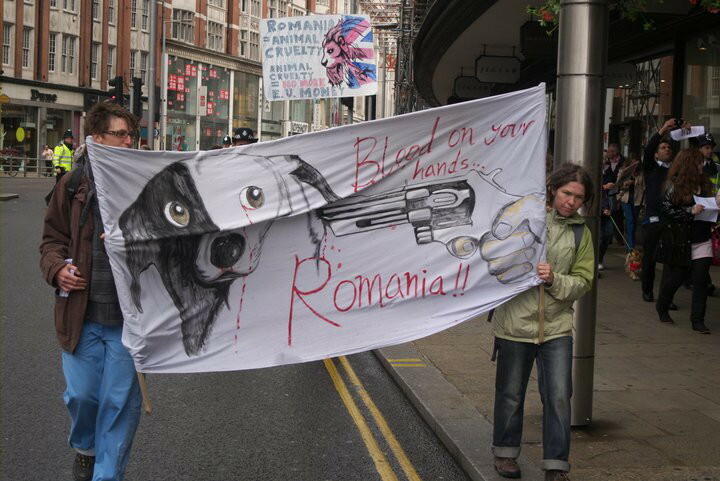 – Demo For the Romanian Dogs – Thursday 26th May – Reminder. of which are in Kensington. The website put together quickly specifically for this event is below. protection now that they are part of the EU.